Grown up as local singer stars, Dasy and Viola are renowned in the local community for being a God’s miracle and a talent to show off at expensive birthday parties. Daughters of a father-agent with a vice for gambling and an alcoholic mother, the siamese sisters are living a “superstar” life surrounded by a surreal town of trash, broken dreams, and miserable lives. The movie is set in a poor town nearby Naples where the immigrant community exceeds the local minority and where Christianity, light of the poorest masses, is tainted by corruption of any sort. Drawing on the current way of life in South Italy, in particularly, the film highlights the trials and tribulations of poor families competing against each other for social acceptance and popularity.The provincial life in Italy is based on appearances, where everyone knows everyone’s business, and where the prospect of being the most envied neighbour is what keeps people alive. It is commonplace for families to run up debts by organising the most extravagant and expensive party of any kind, from birthday parties to holy communion celebrations. This is the hidden dark Italy that director Edoardo De Angelis wanted to make the world aware of. 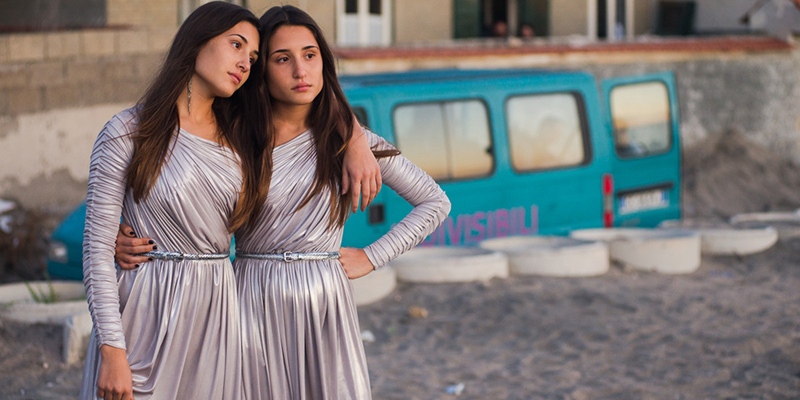 The twin sisters are introduced in the movie as two provincial talented girls raised on a big fat lie which they will be tricked to believe until the age of 18. Dasy and Viola have been exploited by their own father for their whole life to make money for the sake of the family. They have been promised a life of success as long as they will stay together, conjoined as siamese. However, their path will be disrupted and it will change their life forever. Dasy and Viola will meet a surgeon and will be exposed to the hidden truth: they are not indivisible as they first thought. After the truth is revealed, the two sisters will fight anything and everything to escape their miserable life for a better living. Inspired by Janis Joplin and motivated by the sisters’ love for each other, their journey will be a breathtaking and emotional experience.. An obscene truth that will shed light on the darker side of Italy. Ciao I’m Ilaria, a tireless explorer & Italian foodie from Rome who decided to take a break and live in Perth for a while. This city is a good balance of nature, food, and fun – for me, a whole new way of living the best life. I am a social media enthusiast & super passionate about bringing digital businesses to life. I’d love to hear about your business project…perhaps in front of a good cappuccino!